Home \ Blog \ Pepito is a baller. As you can see in the Pepito post from earlier this month, it’s not just generation ñ that is obsessed with Pepito – folks have him on their Flickr, he’s got comments aplenty there. Some re-quoted in our older post below. But Rafa snapped this new pic on his iPhone last week, excited that Pepito was now dressed as an astronaut. This pic is a tribute to a being that has no limits, even the very atmosphere of the earth itself. We swear we know nothing about this billboard expect tat it’s strange, random and funny enough that we obsess about it a bit. 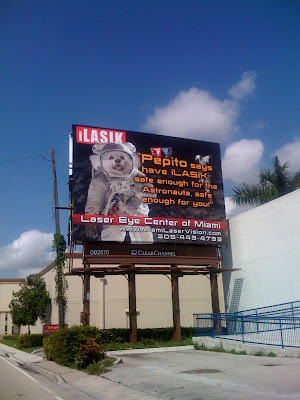 Just say to a friend out of the blue; “Pepito needs Lasik”, and watch their eyes light up. “Oh my God! Have you seen that?” People get so excited, it’s like a private acknowledgement that they’re not losing their minds. I remember my first encounter with him, as traffic crawls along Dixie, “I must be losing it. I think I just saw a billboard with a Water Skiing Poodle who got Lasik surgery.” But no, he’s real. He’s very real. Miami’s been needing a new mascot. The sky’s the limit Pepito.